Have you just had a friend or family member diagnosed with a terminal or life-limiting illness? The CareSearch website has information for patients, families and carers of the person who has been diagnosed with or is living with a life-limiting illness. This information is written by Australian health professionals and is available on the Patients, Families and Carers section of the website. 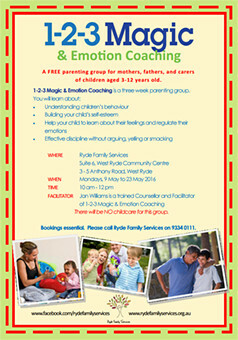 The successful 1-2-3 Magic and Emotion coaching program for parents of children 3 – 12 years is on again this May through Ryde Family Services. Help your child to learn about their feelings and regulate their emotions. Effective discipline without arguing, yelling or smacking. CLICK HERE for the flyer and how to register. Lung Foundation Australia has released a series of patient videos that demonstrate how to correctly use ten popular inhalers including the Tubuhaler and puffer and spacers. CLICK HERE to view the instructional videos. The Cancer Institute’s Break the Chain advertising campaign is now airing across Australian television networks until 30 May. The television ad depicts an Aboriginal woman holding a family photograph and talking about the reasons that she quit smoking – so her kids wouldn’t grow up thinking death and disease were normal. If you smoke and would like to learn how you could take action to quit, speak to your GP or a Pharmacist about what support is available. For more information about quitting visit iCanQuit.com.au. Everyone experiences loss and change in their lives. It may be through death, separation, divorce, loss of home, job, dreams or lifestyle. The Seasons for Growth program provides a safe learning environment for adults to think about and understand their own loss experiences. Men and women are supported through presentations and a reflective group process which provides skills to assist with the journey through the seasons of grief. The program is held over 4 sessions each reflecting a season of nature within a small supportive group environment.